The ER™ Emergency Ready Mosquito & Tick Repellent Kit contains essential items to help repel mosquitos and ticks that can contain deadly viruses including West Nile and Zika. 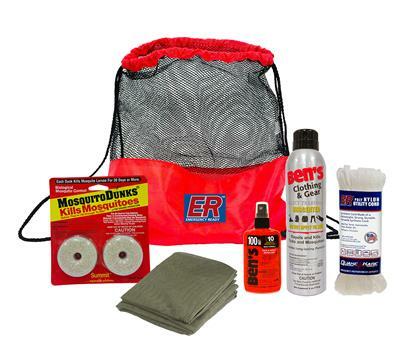 This kit is ideal for any outdoor activity including camping and hiking. It’s versatile and portable packaging makes it a practical addition to outdoor gear and equipment. The kit includes maximum Deet protection for your skin providing coverage up to 10 hours. Also included is insect treatment for your clothing and outdoor gear. The repellent provides long lasting protection to clothing, backpacks, sleeping bags, tents and more. The Mosquito Net provides protection when sleeping outdoors. Use the included nylon rope to help secure the netting to your tent or tree branch. Place the Mosquito Dunks in standing water outside your house to kill mosquito larvae before they are old enough to bite. This kit provides the maximum protection you need when living or visiting an area that is prone to mosquitos and ticks. Sleep soundly under the Mosquito Netting while enjoying a night under the stars.